(Excerpted from a new investigative report, “Blind Faith in Drones,” by Tom Barry published by CounterPunch magazine, March 2013). The expansive vision for DHS drones—linking of border security, homeland security, public safety, and national security—is paralleled by the rapid integration of Predator drones into the state-level Air National Guard units. Testifying in Congress in 2006, Thomas Cassidy, founder and executive director of General Atomics Aeronautical Systems, briefed senators on the range of Predator deployments—from overseas war-fighting missions (involving 70 General Atomics contract pilots and crew) to border security missions to the rapid integration of Predators into the state-based Air National Guard units. The procurement of Predators by National Guard units since 2005 occurred with no public debate or congressional discussion—and no media coverage. Unlike the Air Force reserve units, the Air Force guard units are operational mostly within the United State in response to orders by state governors and occasionally with direct Pentagon support for domestic missions. 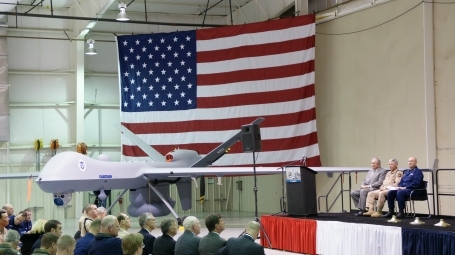 This integration of Predator drones into Air National Guard units across the country has not been accompanied by the issuance of enforceable guidelines and restrictions to protect the privacy and civil rights of US residents whose activities are recorded in Predator video streams. According to the National Guard Bureau, the Air Guard currently includes seven states with UAV units, including California, North Dakota, Ohio, Texas, Nevada and Arizona, with an eighth state in the process of including a drone unit. Budget cuts at DOD and by state governments have resulted in the closure and shrinking of many state-based Air Guard units. However, an increasing number of the Air National Guard units (as distinct from Air Force reserves) that remain active are downsizing their fighter planes and adding UAV units, mainly Predator drones. As manned aircraft age and retire, the Air Guard units with UAVs could soon double to 15 or 16, according to National Guard officials, especially as Predators and other UAVs are increasingly brought home from war-fighting missions abroad. Photo: Occasion of new Predator purchase at General Atomics production facility in Poway, Califorinia , with former GA founder and CEO Thomas Cassidy presiding.